Twitch has just announced on Twitter their very first "Twitch Rivals" Speedrun competition, and what better way to kick things off than speed running Mega Man 11? "Get ready for the first ever #TwitchRivals speedrun competition! 20 of your favorite speedrunners from six countries will battle for $25,000 in Mega Man 11! 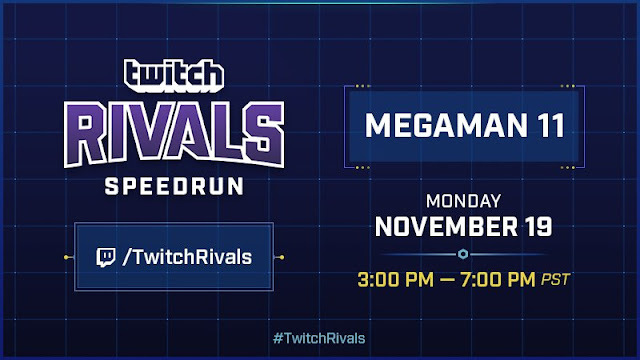 It all begins Monday, Nov. 19 at 3PM PT at Twitchrivals"
Twitch has yet to announce who the twenty competitors are at this time, but this should be great exposure for Mega Man 11 in general and fun to watch! Might pick up some great tips for your next run through the game yourself. Expert/Superhero, buster only, no damage. LET'S GOOOOO!!!!!!!!!!!! This is honestly some of the best Mega Man 11 related news in a good while. It's great exposure, like you said, and helps give new people a chance to experience Mega Man for the first time, via the medium of their favorite streamers no less. Honestly, the timing for this is impeccable. Almost *too* impeccable. One can only wonder if this is a deliberate move from Twitch's part to try and save Mega Man fans from yet another 8 years of silent treatment.